On Thursday morning I reached into the toaster over to retrieve June’s toast. It was way in the back, behind Noah’s waffle. I don’t know why I did it with my bare hand but I did and I brushed the back of my hand against the heating element, giving myself a second-degree burn. As a result, I spent much of the next two days traveling to doctor’s offices, sitting around in doctor’s offices filling out paperwork and getting my hand cleaned and wrapped in gauze by one doctor and then checked by a burn specialist the next day. 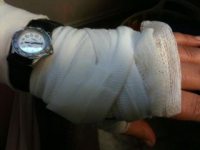 I sported a very seasonal mummy look until the dressing was deemed unnecessary by the burn specialist. I lost the better part of two working days to this misadventure, though I did manage to get to June’s school to see the Vocabulary Parade on Friday morning. Now this was more fun. All the kids chose a word to represent. 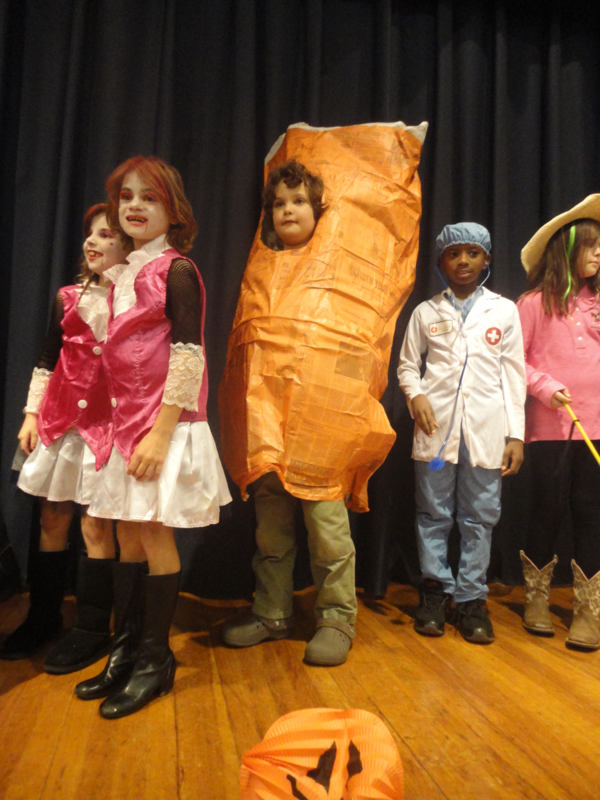 Some classes went with posters, others with costumes, and others with a combination. June’s class had posters with their words, illustrations of the words and sentences containing the word. June’s word was “ardilla,” the Spanish word for squirrel. She needed to walk across the stage holding her poster and say her word. She’d confided in me the night before that she had stage fright. “But it was only the parents watching,” she said. She was right, both the play she was in at her nursery school drama camp the summer she was four and the Sound of Music revue last summer had very small audiences consisting of a dozen or so parents. This audience would be hundreds of students in her school from Head Start to second grade, plus their teachers and a couple rows of parents in the back. So even though she had no lines or songs or dance routines to memorize, this seemed more daunting to her. I watched her class file in and saw her glance at the parents’ area, with the set look she gets when she’s nervous about something. As soon as she caught sight of me her face relaxed and she gave me a huge smile and I knew it was worth the time on a busy day to be there. The parade was predictably cute. The preschoolers either had their word announced by their teacher or said them together in groups of three to four kids who all had the same word. (They focused on vegetables and farm animals.) Starting with the kindergarteners the kids had to say their words individually, into a microphone. June’s class had the theme of school and fall-related words. Even with the microphone I could only make out the words about half the time and since the kids had not been coached to hold the posters facing the audience (or if they had the instructions didn’t stick), only about 10% of the posters were visible. Despite these obstacles, it was just about the most sincere vocabulary parade I’ve ever seen. It’s a wonder the Great Pumpkin did not show up on the spot. When it was June’s turn she spoke her word clearly into the microphone and I could hear her from the back of the room. I never did get to see her poster, but I saw her look of relief as she crossed the stage and went back to sit with her class. I slipped out of the multi-purpose room once her grade was finished so I could go to my appointment at the Washington Hospital Center Burn Center. By the time I got back, it was almost time for Noah to come home. Maggie’s dad had picked June up at school because I was afraid I wouldn’t make it home in time for her bus (and I didn’t). I was frustrated to have barely worked the past two days because I had a new project, a white paper on vitamin E and prostate cancer due Monday that I’d just started on Wednesday afternoon, the day before I burned my hand. All I’d done was spend a couple hours reading and marking up the background research. Not a word was written and we had big plans for the weekend. We normally spread out our Halloween preparations over two weekends but with June at Mom and Jim’s last weekend, we were planning to do all our baking and decorating and pumpkin carving and costume making in one weekend. Plus we were intending to march in the Halloween parade and Noah’s twin friends were having a party and he had a school dance and June had ballet and soccer, and well, you get the point. It wasn’t a great weekend to work. It was also supposed to snow. Yes, snow in October. If you don’t live in or anywhere near Maryland and you’re wondering if that’s normal the answer is no–no, it’s not. Beth found out via a neighborhood listserv on Friday night that the parade (scheduled for Saturday afternoon) was cancelled. The Halloween costume contest would go on inside the school where the after-parade party usually takes place instead. So, I had to work and no parade. Also, no party for Noah’s friends on Saturday. Almost no one could come so they cancelled. June went to bed early on Friday night with a severe headache, making me worry she was sick. I wondered if the whole weekend was going to collapse. “It’s the curse of the mummy’s hand,” I half-joked to Beth. But a little later she picked Noah up from his dance. He’d had fun and he even won an iTunes gift card in a raffle so maybe we weren’t cursed after all. On Saturday morning June woke up “all better” and wanted me to read her In A Dark, Dark Room, a book of scary stories we have out of the library. “And this time,” she announced, “I want to see the ghost.” There’s a page with an illustration of a ghost she’s been making me skip ever since we checked this book out of the library almost five weeks ago. But this morning she was ready for it. Beth and Noah dropped June off at ballet and went to buy costume supplies. I had the house to myself for a few hours and I banged out an introduction, conclusion and the easier parts of the body of the white paper, leaving the most information-dense parts for later. After lunch, June and I cut sugar cookies. We’d made the dough and frozen it earlier in the week so I thawed it and rolled it out and we set to work with the Halloween cookie cutters, making bats, cats, skull and crossbones, tombstones, witches’ hats and other scary shapes. Noah was doing homework, reading a biography of Langston Hughes for a school project, but we saved some dough for him so he could do the last few cookies. Then we made frosting but we set aside the rest of the cookie-making project for the next day so we could attend to more pressing matters. June and I turned to decorating the porch. Usually we have our porch and yard decorated a week or two before Halloween but we’d just started. I’d been doing it piecemeal with the kids over the past couple days. We’d put up the tombstone in the yard and the skeleton emerging from the ground in front of it and set up the spider web with the enormous spider already. 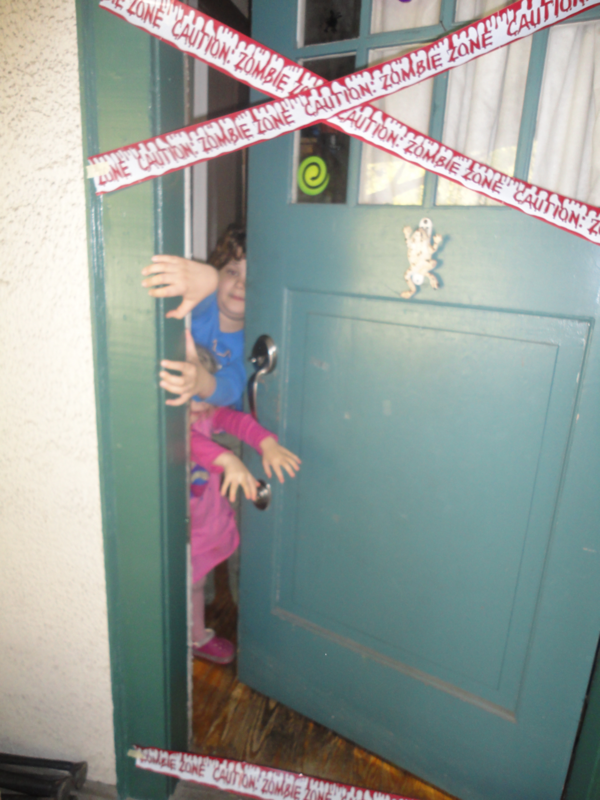 June and I attached the little gummy spiders, spider webs and the word “Yikes” to the front door window panes. We would have hung the ghosts from the tree next but it had been raining all morning and it had just turned over to sleet, which was not inviting weather for standing out in the yard on a step ladder, so I deferred. I think June might have been game. Beth and Noah spent most of the afternoon working on his newspaper costume. They’d bought a sheer orange tablecloth to be the plastic sleeve and they used a spray adhesive to attach newspapers to the inside. You can see the newsprint through the plastic. Beth cut a hole out for his face, reinforced the inside of the costume with cardboard and wire so it would stand up and traced the words The Noah Post and recycling instructions onto the sleeve with a marker. It’s a thing of beauty, but it made me wish I could send my dad, who was a print journalist for decades, a photo of his grandson dressed as a newspaper. He would have gotten a kick out of it. June’s and my next project was scooping out the jack-o-lanterns. There wouldn’t be time to carve them before the parade, but I wanted to have them all ready to go on Sunday. June was a big help. She kept saying, “This is a really messy job,” but she didn’t quit. When the pumpkins were scooped, I made bean and spinach tacos and we ate a hurried dinner before painting June’s face green, getting her into her witch costume and heading out into the wet snow to drive to the rec center for the Halloween party. June changed her mind about what she wanted to be for Halloween many times between August when she declared she was going to be an alien, and her final decision a few weeks ago to be a witch. Witches are one of her biggest fears so we think she might have been trying to work through that by dressing up as one. At the school, June made a beeline for the art table and started coloring a picture of a vampire while Noah and I guessed the weight of a pumpkin and sized up the costume competition. There was a boy about his age dressed as a slice of watermelon who I thought had a good chance at a prize in the eight to ten bracket. I should explain here that Noah has wanted to win this contest forever. He’s had some very creative costumes over the years, starting with the year he was three and dressed as a violin. The year he was six a picture of him in his storm cloud costume appeared in the Gazette, but he’s never won the contest. While they were working on the costume that afternoon, Noah had mentioned he’d want to save it “if anything important happens.” Beth and I glanced at each other. We both knew what he was thinking. Earlier in the day June had said she was not going to be in the contest, but when it was time for the five to seven year olds to cross the stage, she hopped right up to have her second moment on stage in as many days. There were several other witches in her age group, along with a very elaborate mummy, a werewolf, a haunted house and the Virgin Mary holding the Baby Jesus. That last one caused a lot of comment in the crowd. Noah’s group was next. I was still escorting June back from the stage so I didn’t really get a good look at his group, but the watermelon boy was in it. After Noah was out of costume and the next group was up, a contest official came and asked his name. That was a good sign. After all the groups had finished there was a brief musical interlude while the judges conferred. Winners were announced, starting with the two and under group. Noah and I were talking when Beth poked Noah and said, “You won!” Neither of us had even heard it. 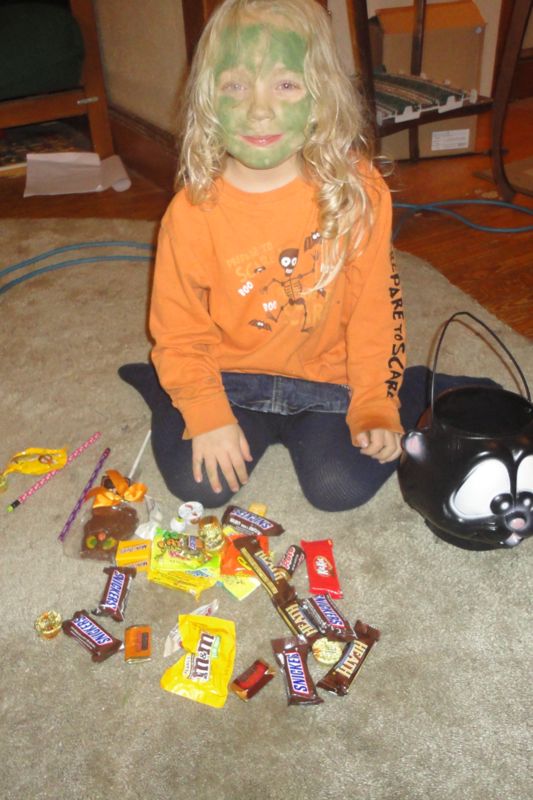 He had to scramble back into his costume and go collect his prize, a cloth pumpkin full of trinkets, such as a little toy skateboard, a Frankenstein’s Monster rubber duck, a pencil, play dough, etc. June couldn’t believe it either. “I thought it was just a party. I didn’t know it was a creative costume contest,” she said in an exasperated tone. “And anyway, everyone who participated got a glow stick whether they won or not.” She was sounding a little sulky now. Beth asked her to let Noah have his moment but she kept it up all the way home. 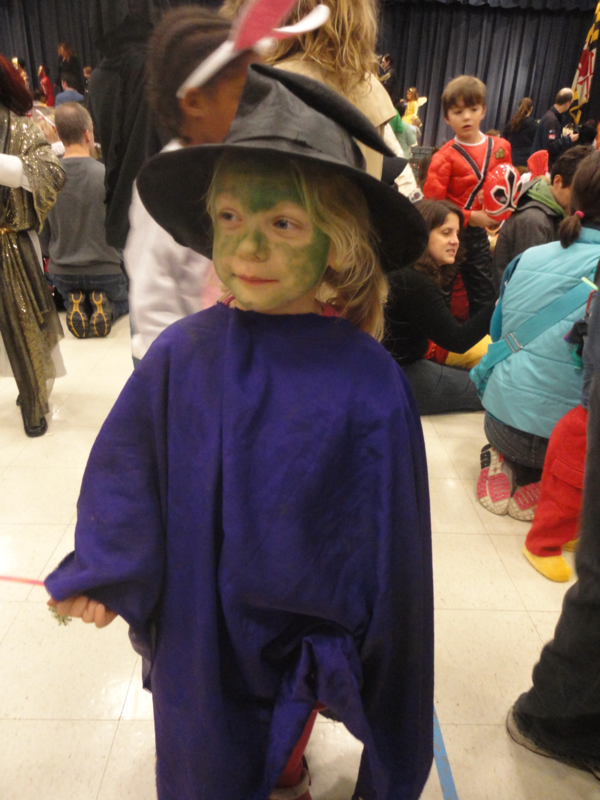 She was green with envy, and it wasn’t just the face paint. But she did not ruin Noah’s mood. He was ebullient and when I put him to bed instead of his normal “Good nighty noodles,” he said to me, “Good nighty newspaper.” Meanwhile, his sister has decided she needs to take an entirely new approach to Halloween costumes. Next year she is going to be something more unusual than a witch, so chances are Beth will have two elaborate costumes to make. Sunday Noah plowed through two more chapters of his Langston Hughes biography and five vocabulary exercises and practiced percussion and typing. In between that I read two chapters of Harry Potter and the Deathly Hallows to him (we read seven over the course of the weekend), we all carved pumpkins (Noah did his own this year and he did a great job), June and I put the ghosts up in the dogwood tree, Beth and the kids colored the frosting and frosted the cookies, and Beth and June strung the ghost lights on the porch. June speculated that passersby would be afraid to approach our house because “We are really scarying it up.” Soccer was cancelled because the field was too muddy to play, which was a shame because it was a beautiful fall day, clear if cool, but on the other hand, who knows how we would have fit everything in if there had been a game. After dinner we watched It’s The Great Pumpkin, Charlie Brown. At bedtime, June was so exhausted she said she didn’t want a story and she was asleep before the second song on her lullaby CD was over. It had been a very busy two days. The kids had Halloween off school, not because it was Halloween but because they always get a day off in between marking periods and Friday was the last day of the first quarter. I sent June over to Merichel’s (aka the Toad’s) house so I could work some more on the vitamin E piece. I couldn’t resist using some of the time she was out of the house to read Harry Potter to Noah, though, because it’s so much easier when she’s gone. Also, Sara had told me I could take until Tuesday with the paper if need be, so I wasn’t feeling too much time pressure. After I brought June home, I made grilled cheese for lunch and June decided she wanted to try to nap so she could stay out later trick-or-treating but she couldn’t fall asleep. While she was trying, though, I worked some more on the white paper and by returning to it little by little throughout the afternoon, I finished it. Also that afternoon Noah worked some more on his middle school application essays, I made pumpkin soup and we put the finishing touches on our decorations. Beth came home from work early to help. Noah strung “Caution: Zombie Zone” tape across the doorway and between the porch columns and found an extension cord so he could play his spooky sounds CD on the porch. We lit the jack-o-lanterns, filled up the Frankenstein’s monster head with candy, set up the coffin with colored mist rising from it and put a strobe light under the raven. Beth made some adjustments to Noah’s costume so he could carry his candy and at 6:15 Noah set off for Sasha’s house. This year for the first time he was trick-or-treating without adult accompaniment. We reminded him to come home by 8:15 and to say thank you at every house. Beth got June into her witch costume and they were out the door by 6:25. I stayed behind to hand out candy to the two-headed monster, ghost. 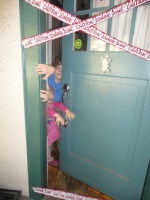 Smurf, hippy girl, ladybug, bee, angel, and other trick-or-treaters who came to our door. Many people admired our decorations. Somewhere in the past couple years we’ve crossed over from people who put up a few seasonal touches in the yard to people who go all out for Halloween. The added element of sound this year made a big difference in the atmosphere, I think. Beth and June came home around 7:20. June showed me her candy and trinkets (and Beth showed me the jar of curried green tomatoes she’d received as a grownup treat) and then she opened the gift my mom sent, a Halloween story with a built-in recording of her voice and my stepfather’s reading the story, and she ate her biggest piece of candy, a chocolate owl lollipop before we washed the green paint off her face and sent her to bed. Noah and Sasha came up the walk at 8:00. If I was standing on the porch fifteen minutes before he was due looking down the sidewalk in the direction of Sasha’s house, it was only because I was looking for trick-or-treaters. Sasha was dressed like the villain from Scream and Noah had an auxiliary bag of candy because he’d filled up his little pumpkin. He must have had at least three times the candy June got. She wasn’t going to be happy when she saw it, I thought. When I asked him how it was trick-or-treating with no adults he said, “Fun!” He said he was taken for a carrot, a pumpkin, an orange and a rocket ship and that he and Sasha had seen a boy they knew and temporarily joined up with him. He looked exhausted but happy. He also had gifts to open from Grandmom and Pop, including glowsticks, face paint, toy skulls and a brain. Instead of saying goodnight to me when I put him to bed, he howled. Another Halloween was over. The curse of the mummy’s hand was lifted. And all was well in the Zombie Zone.